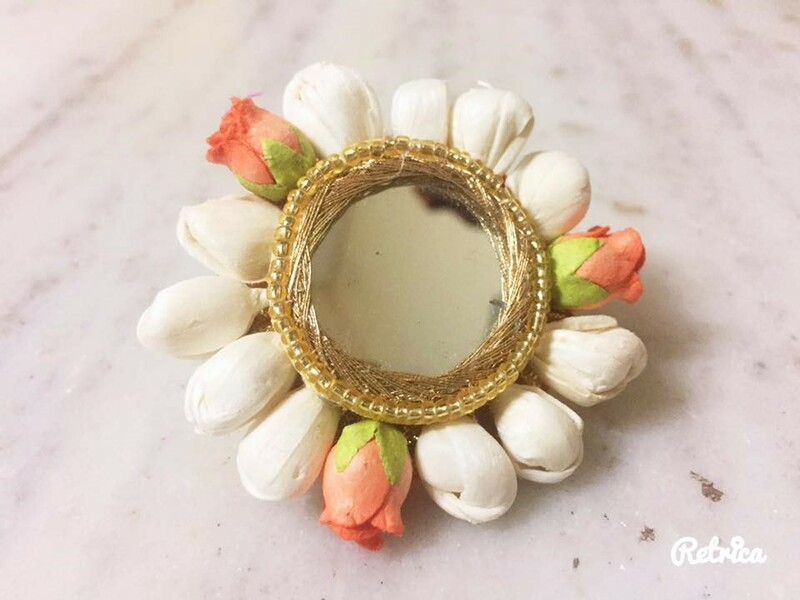 Home / Bridal / Top 10 Places to Get Floral & Gota Jewellery for your Mehendi ! Mehendi functions are so much fun ! A small affair at home with cute colourful décor, games and a Photobooth. The best part? You don’t have to wear super heavy outfits and jewellery. You can wear light quirky lehengas and some refreshing floral or gota jewellery. 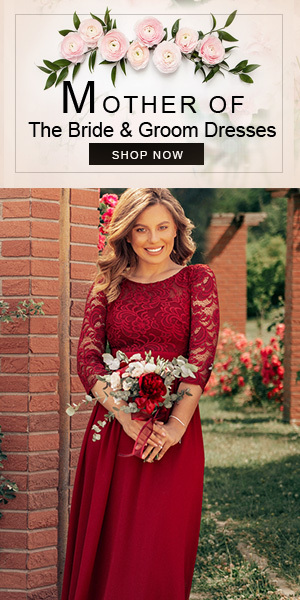 You can search for some unique ideas for floral or gota jewelry online. And to make your job a little easier we’ve put together a neat list of all the places where you can get your hands on some gorgeous Pinterest worthy jewellery ! 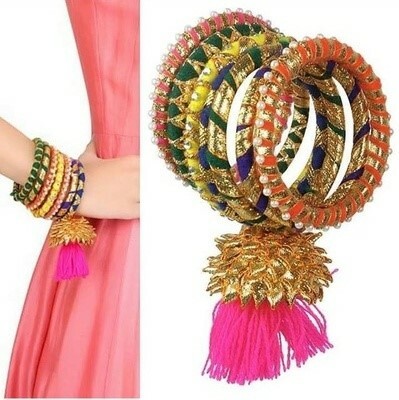 Based in Delhi NCR, it is a one stop shop for all your gota jewellery needs – they have gota baalis, jhoomers, bangles, rings, hair accessories and even full bridal sets. Some very adorable options if you want to give them as favors on your Mehendi. 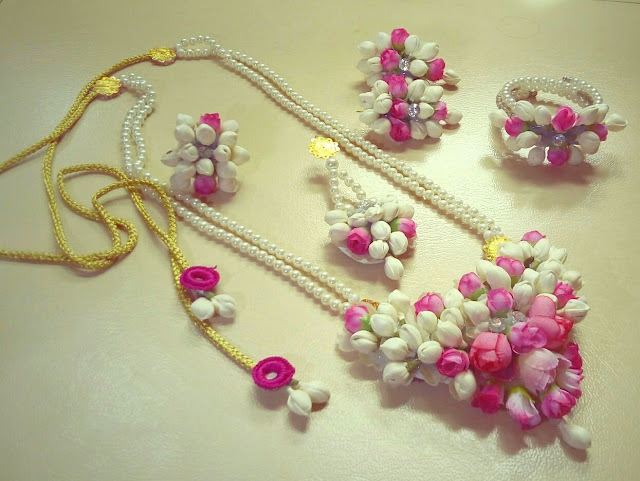 They have a wonderful collection of handcrafted floral & gota jewellery. They use artificial flowers that look just like the real deal and you don’t have to worry about them wilting away. Definitely check out their fusion sets with gota, floral and mirror elements! Siraa is based in Pune but they ship worldwide. Wouldn’t this be the perfect mehendi favour for your bridesmaids ? 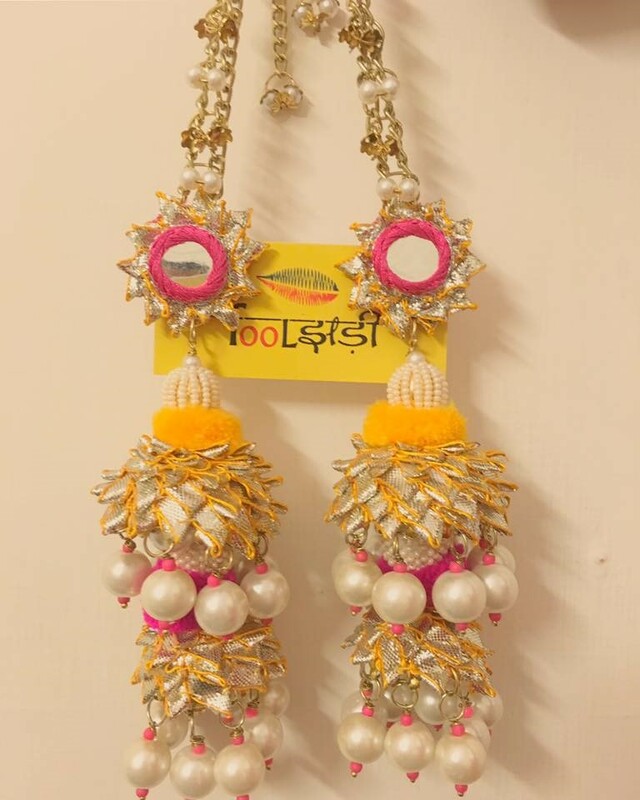 Aayushi is based in Kolkata and does both floral and gota jewellery. What’s more is that she happily customizes the colours as per your requirements. 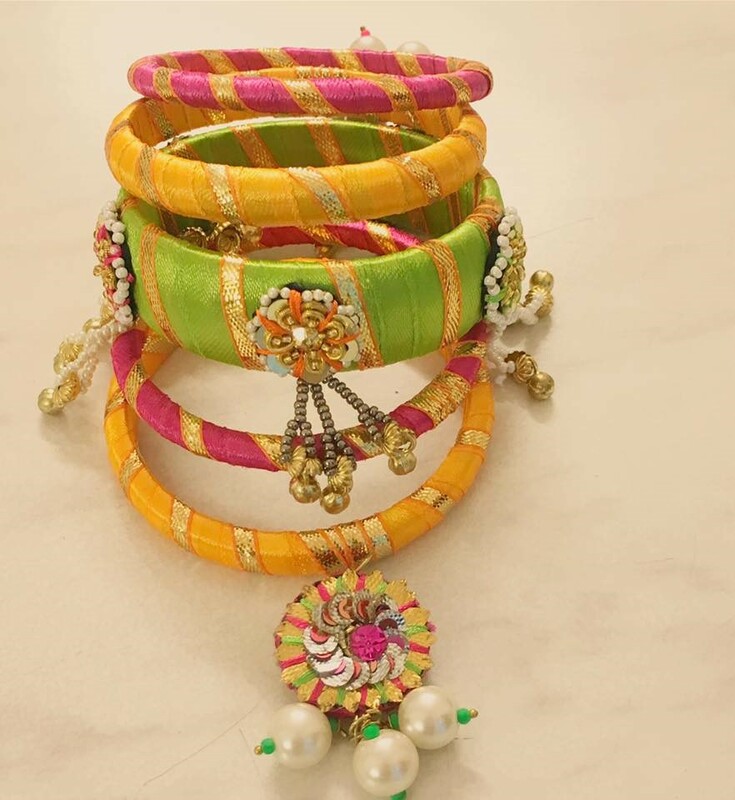 Perfect for your Haldi function or as favours for your bridesmaids. The one with the pom-poms has our heart ! Really pretty handcrafted jewellery and yes they deliver all over India. 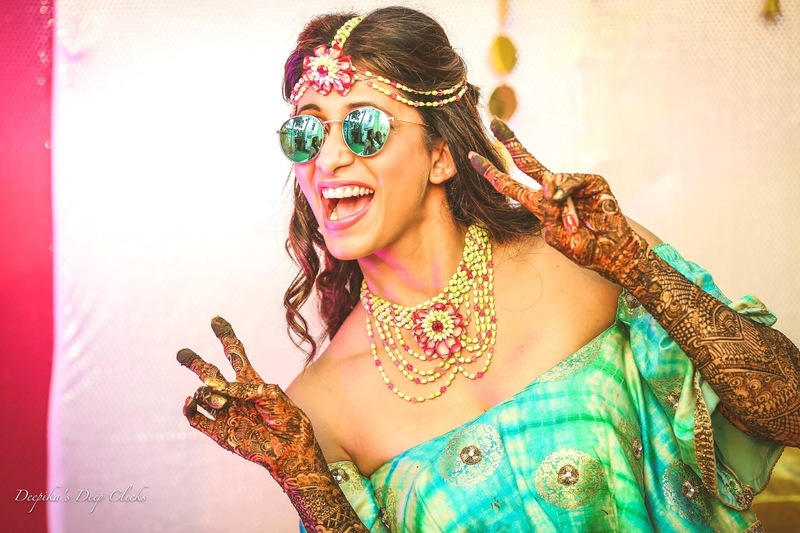 They designed celebrity Kishwer Merchantt’s floral jewellery recently and it was oh so pretty ! They do floral (dried and fresh) as well as gota jewellery. Based in Mumbai, their designs are creative and the sheer variety of their collection means that everyone will find something they love. If you don’t they’ll happily customize some just for you. 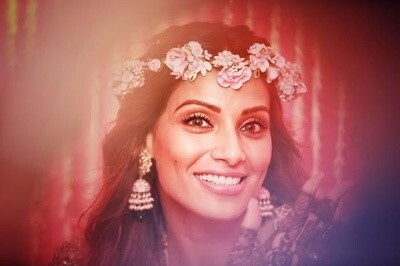 They specialize in artificial floral jewellery and designed the pink jewellery for Bipasha Basu’s Mehendi ceremony. That dainty floral tiara is perfect for a bride, don’t you think? If you’re a bride-to-be you must have spent a lot of time trying to coordinateyour wedding jewellery with your bridal outfit. Well the same goes for your Mehendi function. With so many options out there, you’ll be spoilt for choice. 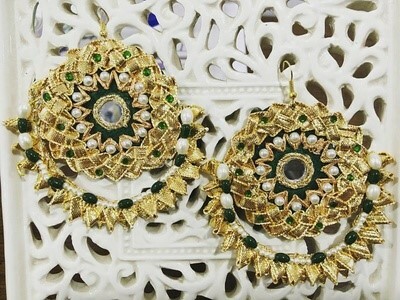 Barkaat Atelier (based in Hyderabad) does some gorgeous gota jewellery – rings, earrings, matha pattis, bangles and even jootis !! South Indian brides, this one’s for all your poola jada & veni needs. Whether you want something that matches the colour of your saree or if you’re looking to go the contrast way – they’ve got you sorted. 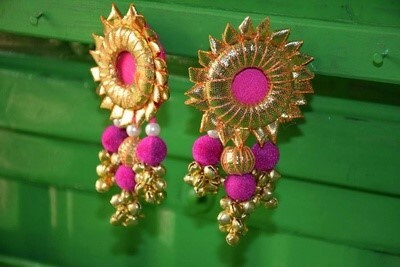 Love, love, love their stylish gota earring collection. They have ones with mirrors, ghunghroos, tassels (lotan) and pom-poms. And since everyone’s going cashless these days, they accept payments via Paytm ! They specialize in handmade gota bangles and make some really beautiful earrings too. 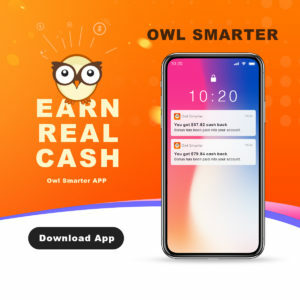 This post is from Wedmegood.com – Indian wedding planning site and app. They have thousands of unique ideas & pictures you would love to follow while planning your wedding. Also, you can search for bridal makeup artists in Delhi, Mumbai and all the other cities on the site. Not just makeup artists but, you can find contacts and reviews for wedding photographers, venues, mehendi artists, outfit designers and other wedding vendors on the site. Check out Wedmegood.com to know more.